Witnesses and cams have recorded UFOs in Mexico especially near the Popocatepetl volcano and the Colima volcano. Both volcanoes have been UFO hotspots for years with hundreds of sightings. 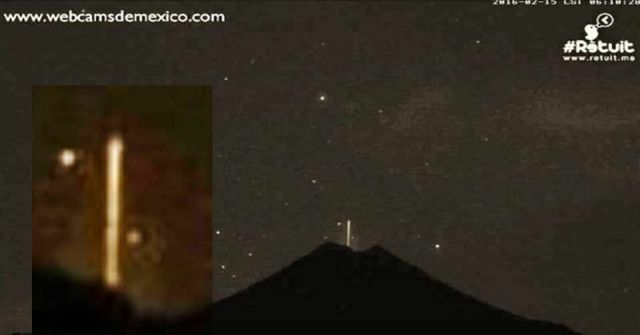 Once again a UFO is observed and this time the webcam of the Colima volcano captured images of a cigar-shaped UFO appearing to plunge right into the top of the volcano. I sometimes record this feed and the page takes snapshots every few seconds. Caught this on February 15, 2016, I don't think it's lava though, no smoke and too straight. Real-time footage.